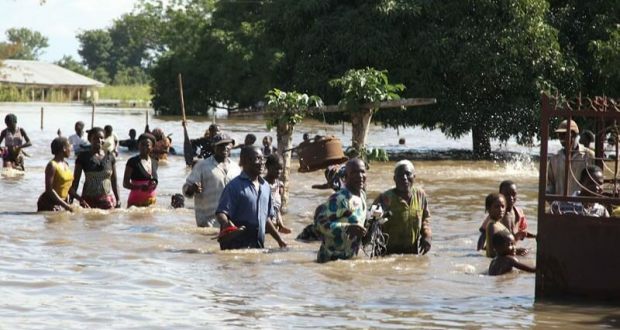 Flooding caused by torrential rains on Nigeria’s border with Niger has left more than 52 people dead and another 20 missing in Katsina State, the emergency services said yesterday. The Guardian gathered that the actual numbers of casualties may never be known because of the time the downpour and flooding occurred. The official death toll rose from 44 on Monday just as the vice president, Prof. Yemi Osinbajo, visited the scene yesterday evening to commiserate with victims of the Jibia natural disaster that also destroyed about 500 houses and more than 5,000 people rendered homeless. He arrived in company of the state governor, Bello Masari. A resident, who gave his name as Balarabe Yusufu, said many people were actually swept away by the flood, which occurred between 11:00p.m. on Sunday and 4:00a.m. on Monday. “The 44 people being claimed as the number of casualties was the official figure and it was based on the number of bodies recovered. The flooding swept away many people while they were sleeping, as their houses collapsed on them. “It was a calamity and we have never witnessed this in Jibia. Look at houses affected . The Federal Government has, however, promised to compensate families of victims of the flood that ravaged over five communities. The Vice President, who paid a condolence visit to the state yesterday, said government would collaborate with the state and National Emergency Management Agency (NEMA) to compensate the victims. Addressing the victims, Osinbajo said: “The president has asked me to assure you that everything will be done to ensure that everybody is taken care of, and that we will make sure this sort of thing does not repeat itself again. “As Nigerians, we all deserve to live our lives happily, we deserve to be treated well, and the president has assured everybody that working with the state government, we will do all that is necessary. Where compensation is necessary, we will compensate, where rebuilding is necessary, we will do so,” he added. About 10 villages in Jibia district were affected after a river burst its banks after hours of heavy rains in the early hours of Monday, Aminu Waziri, the head of the Katsina State Emergency Management Agency (SEMA), told newsmen. “We have recovered 52 dead bodies from the five villages and we are still searching for 20 others. Twenty-four of the victims were washed away to Mada Rumfa and Kantumi villages in neighbouring Niger Republic. Some of the victims were pulled from the rubbles of their collapsed homes,” Waziri said. More than 5,000 people displaced by the flooding were seeking shelter in primary schools in Jibia, while 27 injured had been taken to hospital. Also, 15 communities in Dandume Local Government Area of Katsina have been cut off after a bridge linking them collapsed on Sunday. The bridge, located at Kirijam village, collapsed after hours of rainfall on Sunday. Arewa leaders yesterday sympathized with the victims of the flood disaster, while urging for government and other humanitarian agencies’ intervention to ameliorate the sufferings of the displaced persons. Meanwhile, in the wake of last weekend’s flood disaster in Abeokuta, Ogun State, which led to the death of 12 lives and other valuables, the Nigerian Society of Engineers (NSE), Abeokuta branch, has called on NEMA to immediately step in, to assist the state government and victims of the tragedy. The branch chairman, Muhammed Ishola Abbass, who commiserated with the state, especially affected families, observed that the capacity of government departments, responsible for the regular maintenance of drains, culverts and waterways need to be strengthened, so that prescribed maintenance activities can be carried out routinely, without the need for special government task force intervention. He stated that government needs to intensify its public enlightenment efforts on the dangers of dumping refuse on waterways, with appropriate sanctions for offenders to serve as deterrent, as many constrictions on the waterways were observed to have been caused by debris. In another development, a six-year-old boy was on Monday washed away by flood along Uselu Guest House Street Junction in Benin City in Egor Local Government Council Area of Edo State. It was learnt that the boy was being taken home from school by his mother before falling into an open drain, which was desilted recently prior to the vice president’s visit to the state to commission some projects in area. The incident led to protest by residents, who barricaded the Uselu-Ugbowo-Lagos highway for hours yesterday, disrupting movement on the busy road.